Old friends, new friends, passing friends, friends for life. This year is a crazy mix of brief interchanges and reunions with a variety of people. 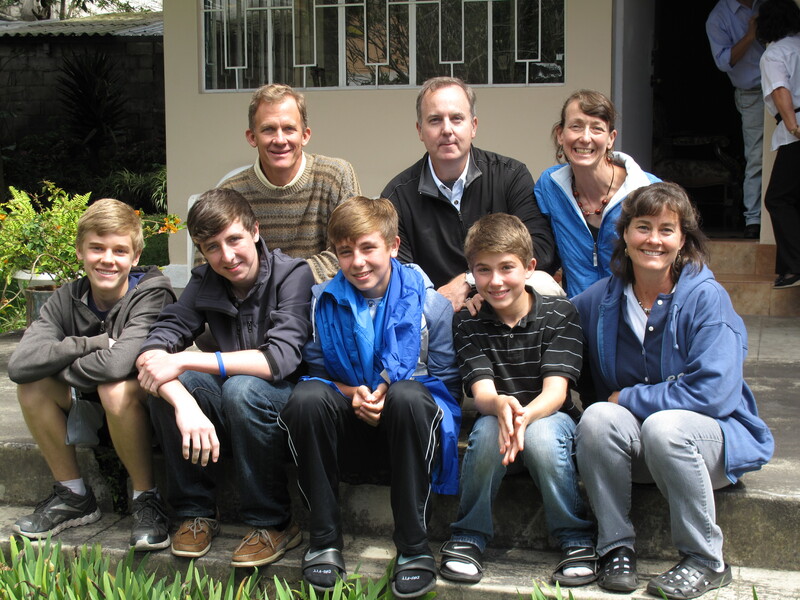 We have just said goodbye to our dear friends, the Mims, who came to visit us in Ecuador for their vacation. Our time with them was a gift, a blessing, and for me, a much needed boost at a time when I felt like going home. I cried as they left, feeling that the gift had been taken away. But the power of the gift remains. Today I feel nothing but gratitude. Knowing that we have such wonderful friends back home and all over the world, that our families await our return with excitement, and that we are midway through our sabbatical year, makes me appreciate this opportunity even more. The anxiety about unmade decisions – which city to live in, where the kids will go to school, what type of work Bob and I will plug into- has turned into anticipation and I look forward to the experiences which lie ahead.We have some good choices. Cuenca is awfully tempting; a beautiful colonial city with loads of opportunities for quality life. The biggest draw to this option is that our good friends from Asheville, the Forehands, live there this year, and we have made new friends, Rebecca and Arturo Garate. They run a business called El Nomad, which offers immersion programs in Ecuador. Bob and I would enjoy working with the Garates because their line of work mirrors our passion for travel and cross-cultural learning. Riobamba is another city we are considering. Riobamba has an excellent high school that the kids are excited about. Bob and I would engage with an agricultural organization called EkoRural. Decisions, decisions. We pray for clarity. Continuing with our Spanish lessons this week, we will try to remain peaceful about not knowing our next destination. Following this week is a couple more weeks of travel and information gathering, and then we will decide where to settle for 5 months. Thank you to all of our friends – far and near – for your support and encouragement through this unique family journey. So happy for all of you! And trusting that my time for travel will come again…Thanks for keeping up with your blog. It is truly inspiring. We never know what is ahead for us but most of us don’t realize it! Your boys looked like they were happy to have their friends there for a visit too. You’re all looking great! What an adventure! Awesome, I’ll be praying with you for your next step. So nice to see you and the Mims together. I know how much they were looking forward to their trip. We had such a wonderful time visiting with you all. In talking with our kids about their favorite parts of our trip they said they enjoyed puenting (bungy jumping off the bridge), bicycling through the waterfalls, swimming with the giant turtles and sea lions in the Galapagos BUT both boys said their absolute favorite part of the trip was seeing their best friends. Thanks so much for inviting us to come visit. We are so impressed with all you are doing, the impact you are having as you interact with so many different people, and the experience you all are having. Your visit with the Minns sounded wonderful. I need to get in touch with her so I can hear all about their trip. We will be praying that your next steps with be met with the same blessings you have already received on this journey. Ethan recently bought an IPAD and would love to connect with you on “Facetime” (?). Carrie, I love following your adventure. Your photos tell a terrific story…just soak it up,you are giving a huge gift to your kids! Miss you! Thank you. We are soaking it in. We miss you guys. Hope you are having a wonderful summer as well.